After the spring, we took an old-school diesel truck to other sites. The first one was a giant red sand dune. It's hard to give you a good sense of perspective on how high we are. The sand was hot on the surface, but every footstep would break the crust and your feet would find cool relief. 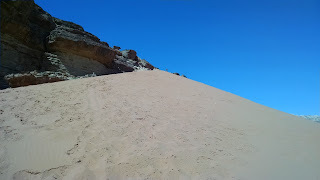 I ran up the dune, stopping only to bury my feet when they felt like they were going to melt off. My view from the top of the dune. If you squint, you might see me taking the previous photo. The rocks here looks so alien, like they are melting. It made me think of some sort of bundt cake drizzled in sauce. Better yet, a "Wadi Rum cake". Another place called Lawrence's house.I'm told it used to serve as a caravan rest stop. Our truck broke down twice, but our guide Attullah fixed it each time. 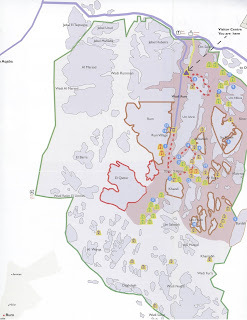 Hey Attullah, do you need some help? 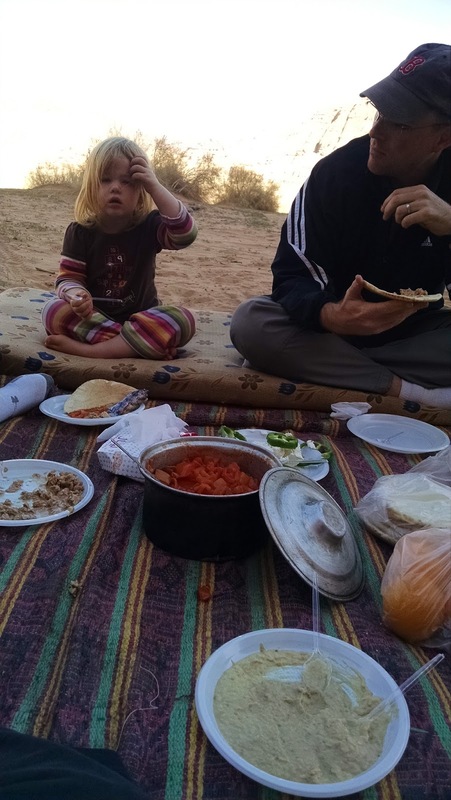 And he also made us a bedouin lunch with lots of tomatos, before we set off on a short hike. It occurs to me that we actually go hiking in a lot of foreign canyons on our vacations, like Partnach Gorge in Germany, Kaklik Caverns in Turkey, and yesterday's hike through the Siq in Petra. Saw a car get stuck in a gulch. Why it was down where it was in the first place, I'll never know. They did eventually get un-stuck. Climbed the arch with the kids. Unlike my visit to Arches National Park, there didn't seem to be any prohibitions on walking up and over the arch. 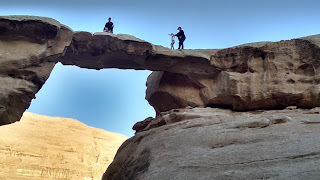 Actual rock climbing in Wadi Rum, however, must not use bolts or drills. Hey, are you sure we should be up here? For dinner, we arrived at camp in the dark, they had a buffet. The in ground chicken was so tender it fell off the bone. The camp toilets and showers had lights, running water, built into cave. 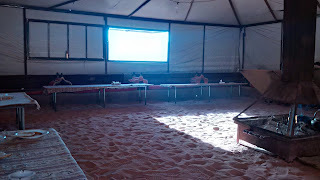 The interior of the tents practically had tapestries. At 4:20 AM, went out and saw nearly full moon and so many stars. Cold night - thick blanket" if you need it." The whole sleeping in tents in a fantastical natural landscape reminded me of when Kacey and I went to Uluru in Ayers Rock, Australia. It was warm in the sun, but quite cool in shadow, and cold at night. When to visit Wadi Rum: February to March was great for us. Not too hot, not too cold (but it still got chilly). This highlights the temperature range in the desert. Ideally, go when the moon is 3/4 full or greater...unless you prefer going during a moonless night, then adjust accordingly. 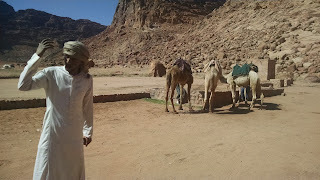 Cost: 5 JOD per adult for the park fee, and around 340 JOD for our group of 4 adults and 2 kids riding 4 camels. From Wadi Rum, we headed south to the coastal town of Aqaba, then back north to swim in the Dead Sea.